I recently made a post requesting feedback from my readers. Thanks to all that participated. I’m looking forward to your feedback always! One of my readers requested I do more reviews on products like creams, makeup, etc. 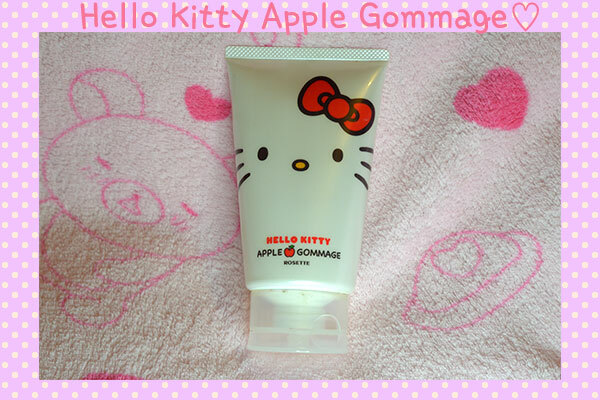 So I’m presenting you with my Hello Kitty Apple Gommage Review! The packaging is really cute, isn’t it?! Please note this product was purchased by me and it’s been a staple of mine which is why I’m praising it so much, haha. Also another disclaimer – my skin is far from perfect.. So sorry if my pictures gross you out! It’s a gentle exfoliator with a gel like consistency. It’s filled with enzymes to help slough off dead skin leaving your skin radiant and smooth! (◡ ‿ ◡ ✿) Although my description doesn’t sound like it, it’s much more gentle than traditional exfoliators such as body scrubs, facial scrubs, etc.